Fans of Christian music will notice an increased presence by Grand Canyon University on this year’s Roadshow, which kicks off a 22-show, six-week tour Thursday in Sacramento, Calif. 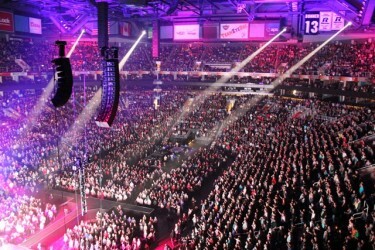 The Rock & Worship Roadshow packed US Airways Center in Phoenix last year. 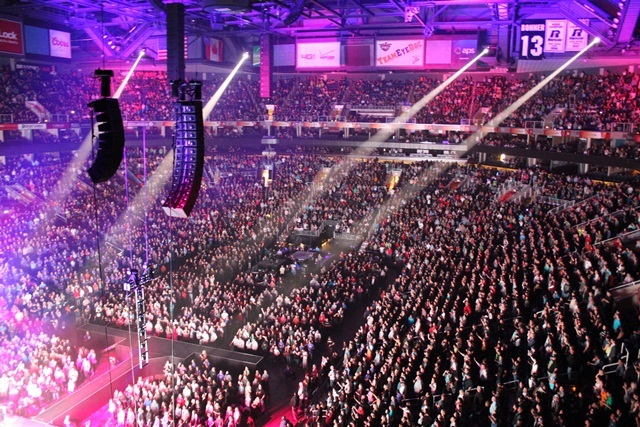 The concert tour, formerly known as the Rock & Worship Roadshow, won’t have MercyMe as its headliner this time, although the band has a financial stake in the tour. Instead, Skillet and Third Day are the top attractions, with Andy Mineo, Jamie Grace, Royal Tailor, We as Human and Soulfire Revolution also among the nine performing acts. GCU has been involved with the tour for five years, and this is the University’s fourth year as a sponsor. During two intermissions, videos narrated by MercyMe’s Bart Millard will introduce GCU to the audience and provide a sneak preview of upcoming academic programs. For the first time, the tour is offering a $20 reserved-seat ticket in addition to its traditional $10 general-admission ticket. More information is available at the tour’s website, www.theroadshowtour.com. “It’s impossible to see Skillet or Third Day for either price anywhere else,” said Scott Fehrenbacher, GCU’s senior vice president of faith-based marketing and development. Third Day, which played GCU Arena in the fall of 2011, includes a pair of GCU online alumni in guitarist Mark Lee and bassist Tai Anderson. With its Southern rock-influenced sound, the band appeals to an older audience than the harder-edged Skillet, which has experienced crossover success. The Phoenix stop on the tour, at US Airways Center, is scheduled for Saturday, Jan. 18. “Our marketing presence on this tour has been months in the planning,” Fehrenbacher said, adding that students and staff wishing to get involved should contact Assistant Director Bret Ceren (bret.ceren@gcu.edu or 639.7723) or Marketing Manager Clint Van Wuffen (clint.vanwuffen@gcu.edu or 639.6870).